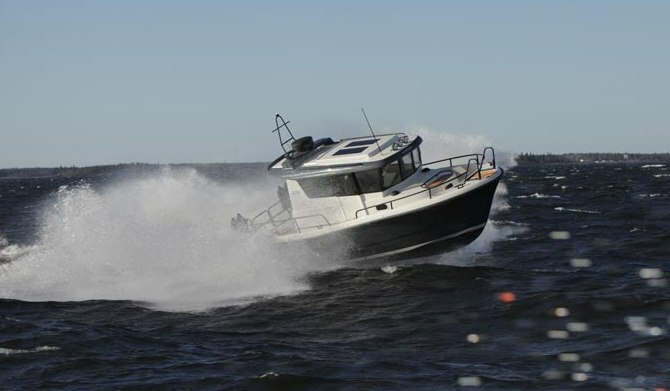 Finnish boatbuilder Thomas Sarin has rebranded the Minor Offshore range as Sargo, with a view to increasing global sales. The Minor brand has been around since the 1967, when Thomas’s father Edy founded the company, and nearly 2,000 boats have been built under the Minor name in the past 47 years. However, with rising sales in 15 global markets, including Japan and Russia, and an 86% export level, the company has decided it is the right time for a change. The company explained that the name Sargo combines the family name with the verb ‘to go’. The alternative and altogether more maritime reason behind the name, is that Sargo is a species of fish that can be found in the Mediterranean sea, as well as the eastern Atlantic and western Indian oceans. The rebrand coincides with the Finnboat Floating Show, which takes place this week on the Finnish archipelago of Nauvo. The Sargo collection ranges from the 25 Explorer (below) to the 36 Flybridge (above), while various tailored vessels have also been created over the years.